I liked, but did not love, The Lego Movie. I definitely wasn’t ready to fight for it to win an Oscar, nor was I offended when it wasn’t even nominated. It was good, had a fun story, catchy music, and I liked seeing my favorite childhood toy come to life like that. But, to be honest, the humor was kinda stupid. It was a style of comedy that I didn’t enjoy, juvenile at best, and a bit too Hot Rod for my taste. SNL can be that way at time, and it was definitely an SNL cast: Will Arnett, Will Forte, Will Ferrell (why so many Wills?). And look at the directors, these are the guys behind 21 & 22 Jump Street. Again, funny stuff, but also pretty stupid, a kind of slap-stick, over-the-top romp that you chuckle at but then judge yourself for. So here’s a kid’s movie crafted with the same comedy, and guess what, I didn’t think that the jokes were that funny. 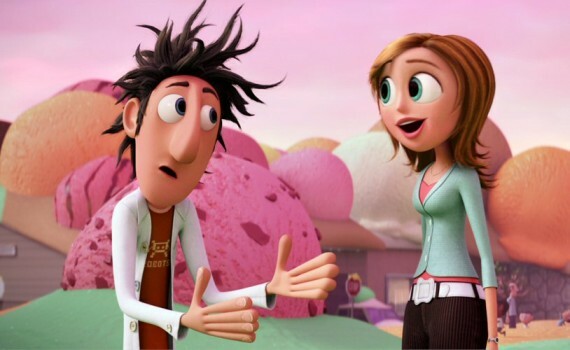 Flint Lockwood is a young man who has never lived up to his potential. He’s a brilliant scientist & inventor, but nothing he makes has any practical application and ends up exploding more often than not. His town doesn’t appreciate him, they’re all too busy trying to survive the loss of their local sardine economy. His father doesn’t understand him, he wants Flint to be a simple fisherman like his pop. But Flint refuses to give up, and his latest creation might be the one that finally proves useful. It’s a machine that turns water into food, whatever food you want, and when it accidentally gets sent into the stratosphere, wonderful cuisine begins falling from the sky. Well that’s great, until the machine becomes overused and starts going haywire, raining down giant hotdogs, spaghetti storms, and a food typhoon that may wipe out the world as we know it. I’ve never read the children’s book that this movie is based on, but I have to imagine that I’d enjoy it so much more that the film. It wasn’t the animatio that I didn’t like; that was actually awesome. It wasn’t the story or the characters or the action; I had a relatively good time sitting with my kids and enjoying a well-crafted 90 minutes of food fight. But the humor just wasn’t for me. I wish that they had handed this project to someone else, anyone else, other than Lord & Miller, a couple of guys whose comedy only works when you use it in an adult setting. As it was, every single joke felt forced, idiotic, and out of place. I cringed so many times at the lack of self-awareness that must have clouded every brainstorming session, each moment that someone must have said “that’s hilarious!”, when to me it was anything but. I respect that I might be in the minority here and I don’t judge you if you let yourself laugh & have a good time while watching this film. I just couldn’t do it. In every scene I would have done something different, made a different joke, held myself back from thinking like an 8-year-old boy. I get that this is a kid’s movie, but so is How to Train Your Dragon, which is exponentially better in all ways.